Winter and Spring terms are officially underway. We already have 3,500 students enrolled who are already learning about, and contributing to, Wikipedia. But as an instructor, how are you supposed to keep up with all that work? Especially if you are just learning about Wikipedia for the first time yourself. Luckily, the Wiki Education Dashboard is here to help! The number one action that will set your students up for success with this project is completing the assigned training modules. We’ve set the Dashboard up so that students are only assigned the required trainings that they need to complete the very next assignment. So if students fall behind and aren’t completing the trainings, they will be more likely to run into problems and to ask questions of you and our staff that are already answered in the trainings. To see a quick snapshot of whether your course is up to date with the trainings, head to the Home tab of your course page and hover your mouse over the “student editors” number. If you see, for example, that only 15 of your 24 students are up to date with the training, then we know it’s time to send a reminder. The Dashboard actually has a tool built in that helps you do this! Just head to the Students tab of your course page and click the purple chat box located to the right of the “enrollment” button – this will open up a dialogue window asking “This will post a reminder on the talk pages of all students who have overdue training. Are you sure you want to do this?” – click OK! and you’ll be on your way. The Students tab also shows you an overview of where each student is though the trainings, noting “2/7 trainings completed” for example, in red below each student user. This means that you’ve assigned 7 trainings throughout the term but that your student has only taken two of them so far. At this point in the term, they are probably right on track! The first few weeks of the term can be pretty hectic. Students are adding and dropping the course and trying to get up to speed as fast as possible. If you’ve lost track of your course specific enrollment link in your email, you can always find it on your course page to share with new students. Just head to the Students tab, click the purple “enrollment” button, and share enrollment URL linked there. If you have a student who mentions that your course login requires a passcode, you can find your course-specific passcode saved there for you. Students tab on the Dashboard. If you have students who drop the course mid-way through, you can manually remove them from your course page. Just use that “enrollment” tool on the Students tab to remove a username. Simply click the (-) button next to the username, and click “OK” when asked to confirm the change. The early Wikipedia assignments ask students to evaluate an article, compile their bibliography, and start working on their draft all in their Sandbox. Luckily, the Dashboard has quick links for you to review their work each week. From the Students tab of your course page, there is a (sandboxes) link below each student username. Clicking this link will open up a new tab on your computer with a list of “all pages with the prefix” of your students’ username. 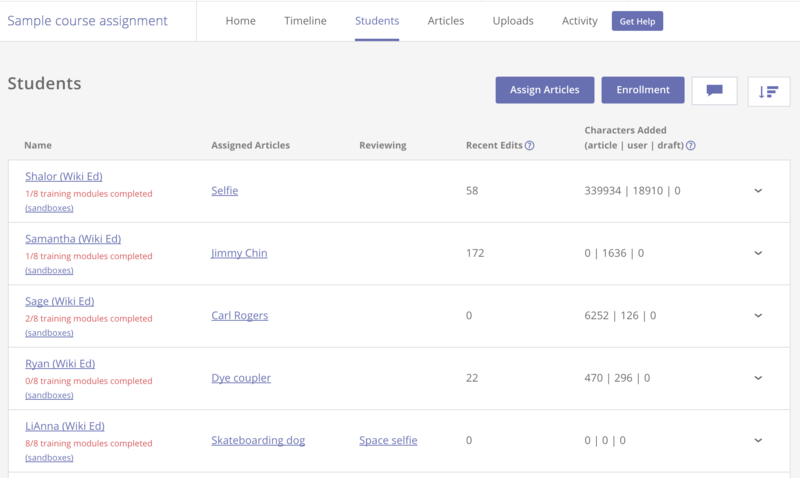 Just simply click the username/sandbox link and you can review any work your students have done in their Sandbox so far. This button also lives on the Dashboard. If you and your students are logged in, there will be a purple “Get Help” button along the title line of your course page. As the instructor you’ll see a quick link to instructor FAQs, but your students will see student FAQs and have the option to message with their assigned Wikipedia Expert if they have a “question about editing Wikipedia”. Articles tab on the Dashboard. The right column offers a few “assessment tools” that you can use to review their work. Selecting the “current version with authorship highlighting” tool (it looks like a notebook paper) you’ll be able to see a color-coded highlight of exactly what your students’ username has contributed to that article so far. If your students are working in groups, each group member will be assigned a unique color. And the bottom of the popup includes a list of “edits by” with student usernames. As the instructor, if you hover over the username, you can see the first and last name of the associated student. Another great way to assess student work is via the “article development” button below the article title. This graphs the rise in “structural completeness” of the article from the point the student started working live until now. Look for an upward trend in the graph over time. This means the article is improving based on a machine learning calculation that takes into account amount of prose, the number of wikilinks to other articles, the numbers of references, images, headers and templates, and a few other basic features. For more tips about your Wikipedia assignment, see our blog post about setting expectations early in the semester.